I just thought I'd share another simple drink idea, for rainy days ahead. I'm not sure why, but I have been craving the spiciness of ginger lately, so I incorporated it into my night time hot drink ritual. My sweetener of choice for this drink is honey—I find it has a milder flavour than maple syrup, so it doesn't compete with the ginger. I tend to add a lot of ginger and let it steep for a while to ensure a strong ginger taste—I love it, but feel free to add less. 1. Prepare your ginger, any amount that suits your tastes. In a saucepan, place ginger and 1 cup of water. Bring to a boil and let simmer for about 30 seconds. 2. Add your cup of milk and bring to desired temperature (do not boil). 3. Meanwhile, measure honey into awaiting mug. 4. 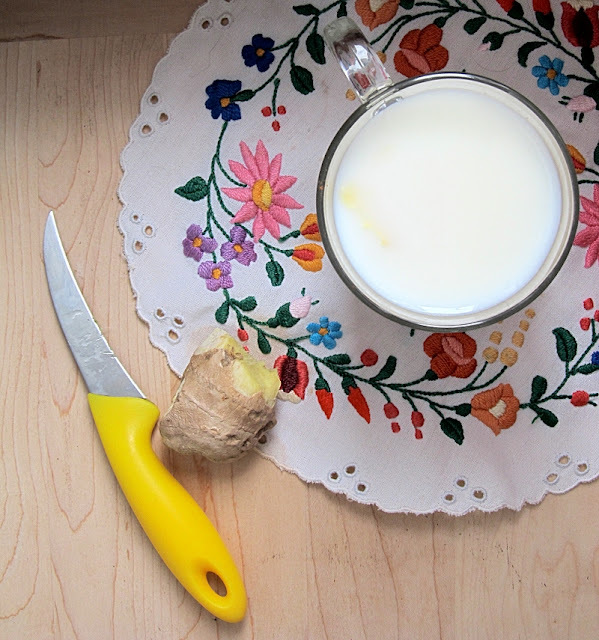 Pour your ginger liquid into the mug, stirring to dissolve the honey. Discard ginger pieces. Also very good if you are sick I would think! Especially if you add some lemon for vitamin c.
Oh Beth, this looks wonderful. I love steamed milk. Coconut milk for me though of course :) It's nice to see such other lovely food and painting blogs.